Good Monday Morning! We’ve just returned from a whirlwind trip to promote our new book, and we can’t wait to tell you all about it! It was SO fun meeting so many of you! I’ll share some pictures later this week, but I figured in the mean time we’d better get back to some food so I have a great little tutorial for you to make gorgeous (and delicious!) 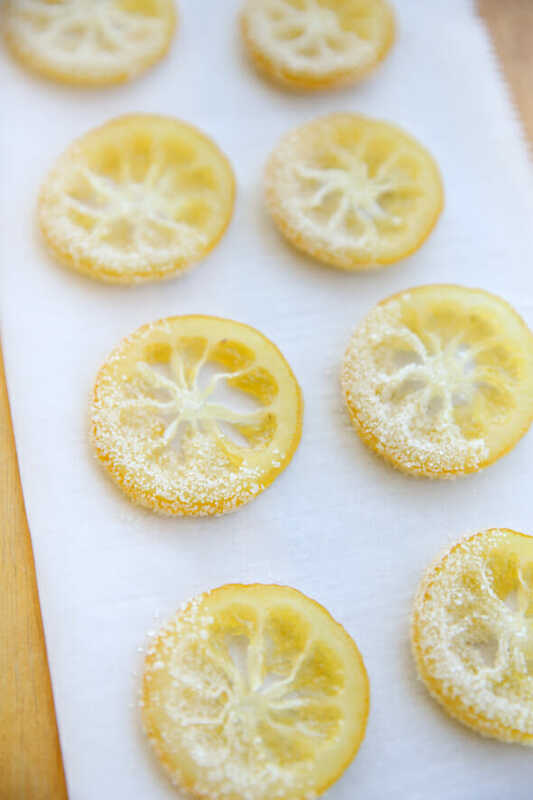 candied lemon slices. This method works just the same way with any citrus, so try it with limes or grapefruit, too! Candied citrus makes an insanely beautiful garnish for deserts and they can be chopped up and used in recipes, too. 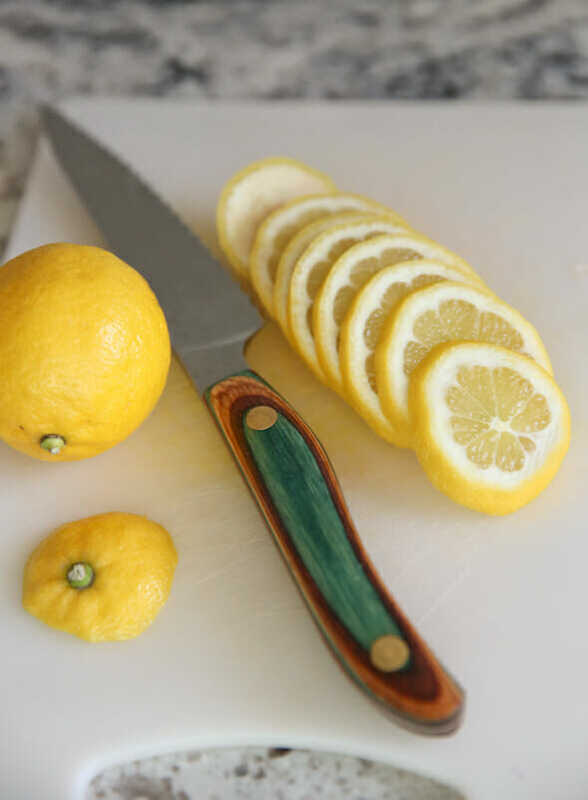 Start by slicing your citrus in thin, uniformly-sized slices. Place this in a pan with some simple syrup. Simple Syrup is just a mixture of water and sugar that’s been boiled into a nice thick syrup. 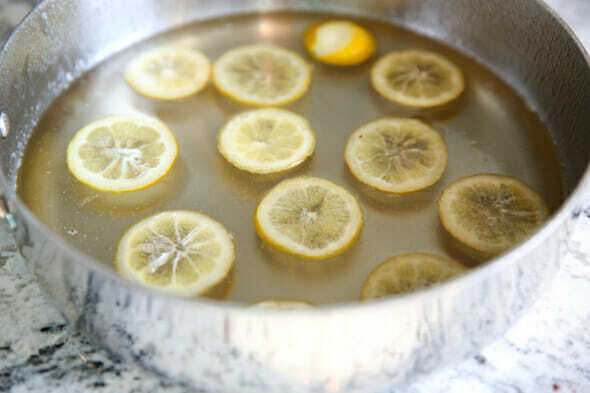 Let the the lemons simmer gently in the syrup until the rinds appear softened and the centers are translucent. You want them to get cooked enough that the rinds get fully candied, but not so much that the lemon slices disintegrate! Usually about 15-18 minutes does it for me. Obviously if you slice them thinner they’ll cook faster and thicker slices will take longer. When they’re done, gently remove each slice, letting excess syrup drip off, and lay them on a piece of parchment paper. I like to let mine sit for a full 24 hours, but if you refrigerate them to speed the drying process, you could use them a few hours after you take them out of the syrup. I like the drier texture and feel after they’ve sat out for a day so I just leave them on my counter overnight. At this stage, you can eat the lemon, rind and all! It’s still slightly bitter, but since it’s absorbed all of the sugar, it actually tastes pretty yummy. When I use these to garnish desserts, I like to dip them (either entirely, or half-way like you see in these photos) in sugar to make them sparkle. 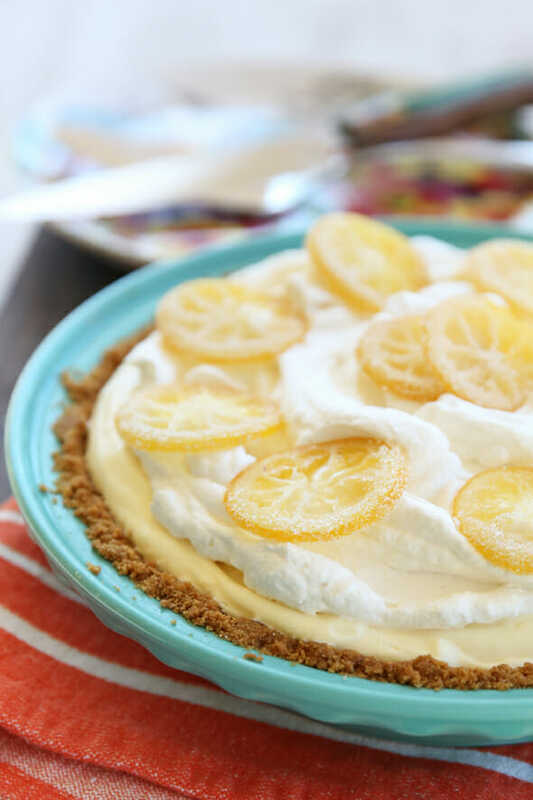 Then you can use them for your recipes, like this Lemon Cream Pie! 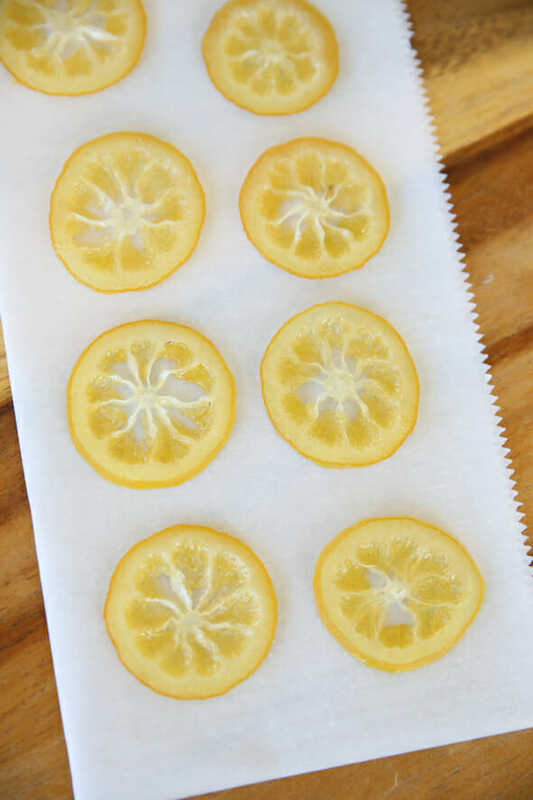 Hope you enjoy these candied lemon slices. Let me know what you make with them, or better yet- snap a pic and tag me on Instagram so I can see! 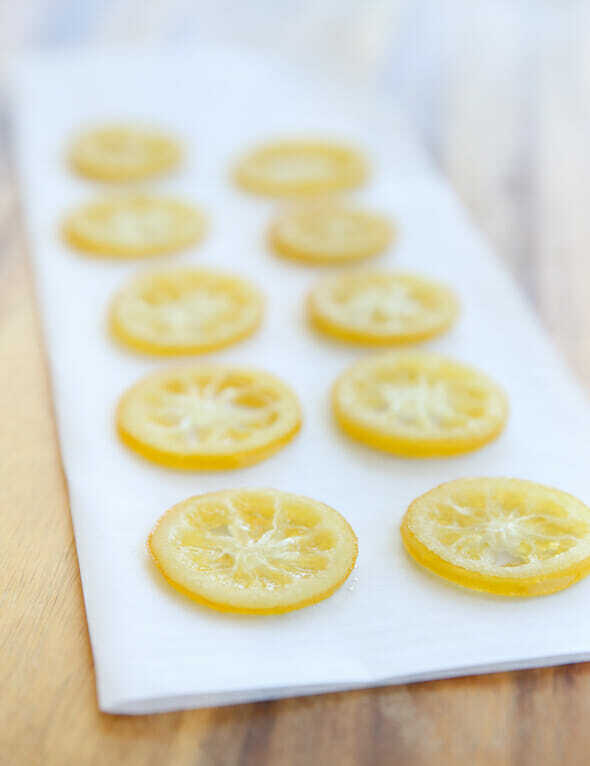 Sweet, tart, candied lemon slices make a beautiful garnish for desserts or sweet treat. Whisk sugar and water together in a sauce pan. Bring to a simmer and stir until sugar is dissolved. 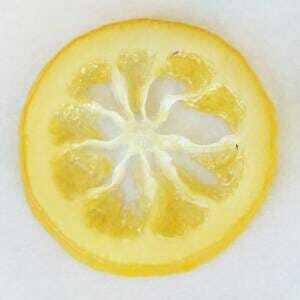 Slice lemons into uniformly thin slices, about 1/8 inch thick. Lay in a single layer in the simple syrup and lightly simmer for about 15 minutes, until rinds appear softened and slightly translucent. Carefully remove from pan, letting excess syrup drip off, and lay on parchment at room temp until dry, yet tacky to the touch (they will always be sticky). May store in the fridge for several days. Dip in granulated sugar for a sparkly look. 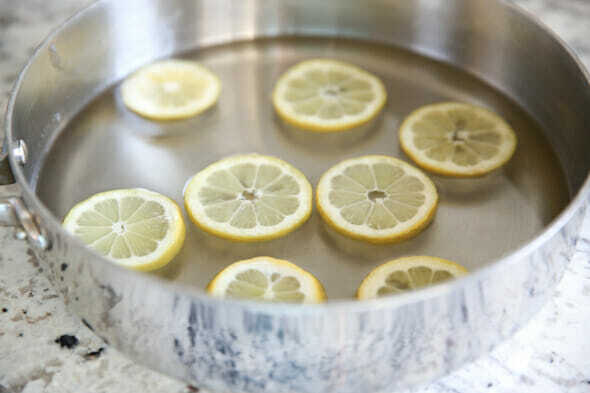 Repeat with syrup for as many lemons as you like. The cooled simple syrup may be used to make drinks, it’s delicious! Perfect timing! I was just about to make a lemon dessert last weekend but thought it would be better with some sort of candied lemon to garnish it but didn’t know how to do it…now I do! Thanks for a great blog with awesome recipes and tutorials! So if I decided to do candied orange slices, it would be the same method? After they’ve dried and you dip them into some sugar for the sparkle, do you just dip them in some water to get them wet to make the sugar stick? Yum!!! I’m so excited for these!!! Not to step in here, but I wanted to let you know I used the same method for oranges and they turned out beautifully. Also, I think it’s mentioned above in the recipe, but the slices will always be somewhat sticky – so that will help the sugar stick. 🙂 Hope this helps! Yes, what Jana said! This method works the same for any variety of citrus, and the sugar syrup (even dried) is enough to make the granulated sparkly sugar stick. Gorgeous! 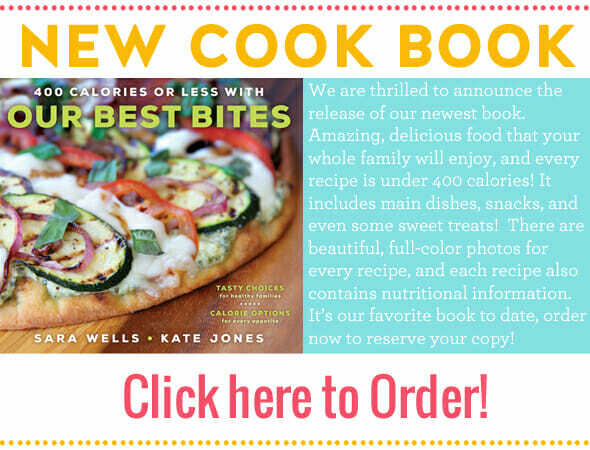 Can’t wait to see the recipe, too. YUM! Oooooh! These lemons are lovely! I’m so looking forward to trying this and the receipe that goes with it ! Thanks for this amazing blog ! Awe, so jealous! I visited Switzerland years ago and it is seriously one of the most beautiful places on the planet. I would love to get back there! Hope our book makes it there safe and sound! Do you actually eat them if they are on a pie? I never know if they are only for looks or taste? Are they good on their own? Excited to make these! How long will they last? A few days, a few weeks, or ??? Thanks! Definitely a few days, and probably longer. Sorry I don’t have an exact time for ya! Looks amazing. Will the syrup be flavored and can you use it for something else, like sweetening tea. I’ll will definitely be making these. Yes DEFINITELY save the yummy syrup- it’s perfect for drinks!